Qualification: BE/B.Tech or equivalent in Electrical/Civil Engineering and qualified GATE 2019. Selection Process : Selection will be based on GATE 2019 Score & Interview. How To Apply: Eligible candidates may apply Online through the website http://www.bsnl.co.in from coming soon. 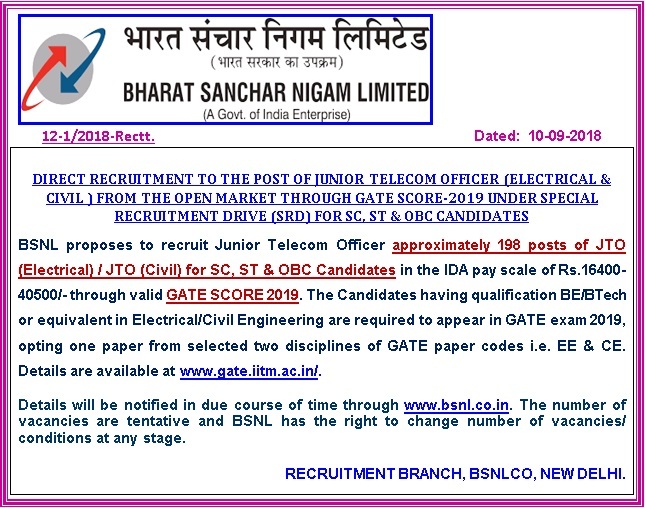 Hope Our Readers are able to get all Important Details about BSNL Recruitment 2018. Aspirants Can Comment us their related query below. Our Team Member will reply you as soon as Possible. Next Genpact Walkin Interviews For Freshers/Exp.